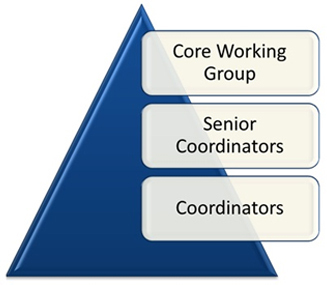 The Core Working Group consists of Youth Team, who has been associated with "Initiatives of Change - LMAD" for over 8 years and has exhibited consistently moral values and ethical leadership in their respective professions and public life. This Core Working Group will work behind the scenes, selflessly and tirelessly. This core team will participate in International and National Focused based programs. Every 6 months the advisory group evaluates performance and suggests any changes in this Core Working Group. Senior Coordinators have been associated with "Initiatives of Change - Let's Make a Difference" for over last 5 years and have complied with 4 values by regularly practicing introspection to enrich themselves. They nurture City Chapters and support local conferences and lecture series to take the message of introspection, inner change and living by moral values to the Youth. Every Region has 2 Senior Coordinators who are playing the role of Regional Coordinator. For more details on Regional Coordinators please read City Chapter. Coordinators have been associate with 1 to 4 years of experience. If Coordinator does not meet expectations and standards, will join back as participant and will be revaluated. We encourage you to email us at iofc.lmad@gmail.com if you observe any behavior by the above coordinators that is not consistent with values and purpose set by the organization. We are confident that our team lives by example and would like to take it as challenge to correct any wrong behavior by them.